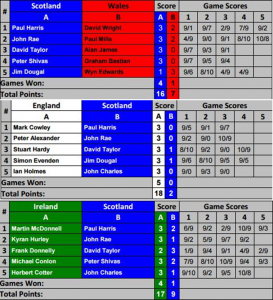 The team squad for the weekend matches consisted of John Charles, Jim Dougal, Paul Harris (Capt. ), John Rae, Peter Shivas and David Taylor. First match on the evening of the 29th was against Ireland. John Charles playing on his international debut played an excellent match against the Irish No: 5, narrowly losing a tight 3-2. Following this David Taylor restored parity by winning with a strong performance at string 3. Match score 1 all. 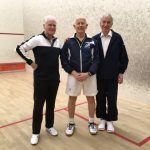 In the subsequent matches at 1 and 4, Paul Harris and Peter Shivas both held match points against solid and resilient Irish opponents before losing and sadly the international tie overall. In the final match John Rae also came up against a fit and focussed opponent who ran out 3-1 winner. So, a match score of 4-1 to Ireland was the result, although the final score line rather belies how close the match was throughout. On the Saturday morning Scotland faced a massive task against one of the strongest English teams assembled from of a selection of current and past World, European, British Open and Closed champions. Scotland’s team consisted of Paul Harris, John Rae, David Taylor, Jim Dougal and John Charles. All players were not intimated by their respective opponents and each put in creditable performances. Inevitably England were not to be denied and ran out the match 5-0 with the concession of only two games. 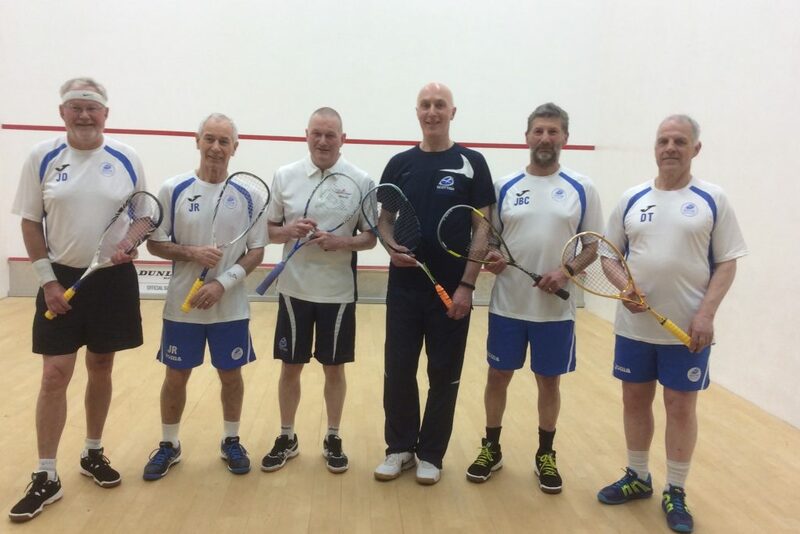 In Scotland’s final match of the series against Wales, the team fielded consisted of Paul Harris, John Rae, David Taylor, Peter Shivas and Jim Dougal. Wales also fielded a strong team who despite the loss of their No: 1 to injury, every player stepped up to the mark and played well above their level. However Scotland also were in no mood to be denied and came through the first three strings at 4, 5 and 3 with a 2-1 lead. A further two five set matches ensued at strings 1 & 2 with both results finishing 3-2 in Scotland’s favour, rounding off a final match score of 4-1. 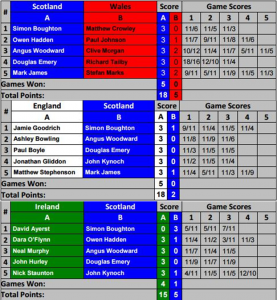 Overall, Scotland finished in third place in the tournament behind England who won, with Ireland narrowly taking the runners up slot. The event was a highlighted by consistently good performances from all players and teams from the respective home countries, each of whom were well prepared mentally and physically for the weekend’s rigours. 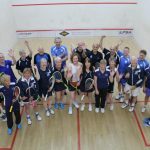 The Scotland team would like to express thanks and gratitude to Irish and Scottish Squash for all their efforts in arranging and hosting the Dublin event. Special appreciation is also due to the Fitzwilliam Club and all their staff for giving such a warm welcome to all the teams with their superb hospitality over the weekend, and a memorable evening celebration dinner. Unfortunately due to a last minute withdrawal and a weekend of unavailability Scotland could only field a team of 4 for the Ladies O35/40 event in Dublin. However the 4 musketeers set off in good spirits to see what we could do and keep the Scottish flag flying. Amazingly we narrowly pipped Ireland by 1 point to be runners-up to England. All the matches were closely contended with every point counting. Hurricane Helen blasted everyone off the court and won all three matches 3/0. Fantastic Fiona ground down all her opponents and again won all 3 matches. Granny Mo Mo (hard to believe I know or so I tell myself) bagged a few points. Debutant Debbie made the jump from Junior to Masters Internationals to get that critical point. Great team effort and fantastic result to be second with only 4 players with such tough opposition. No easy games. 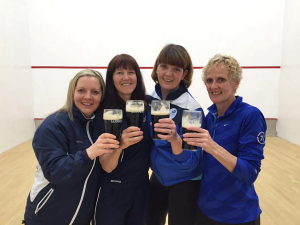 Thanks to Irish Squash for hosting such a great event. Always a pleasure to come to Dublin. Expect to see a few new faces in this team next year. The youngsters are out there. Keep the weekend free!